I have been out ice fishing every day this week, taking advantage of the unbelievably warm, sunny weather and the scorching hot bite. It doesn't seem to matter what we're targeting - lake trout, walleye, yellow perch or black crappies - the fish are on a tear up here in Northwestern Ontario. By the way, we have less than half the amount of ice we normally have at this time of year and I had to turn around twice this week, on two different lakes - one of them Lake of the Woods - when I encountered huge pressure ridges with open water on one or both sides. It was scary, to say the least, and I am glad I wasn't travelling quickly in the dark and coming upon them suddenly. You could have skidded into open water. But the fish sure certainly like what is going on, so long as you have the right delivery agent. I was thinking about that last night, when I caught a gorgeous walleye on the very first drop down the hole, while field testing one of the Peter Rosko's new Sonic Baitfish lures. If Peter's name is not familiar, some of the lures he has had a hand designing will be - especially the Crippled Herring and Kandlefish. Indeed, back in the days when Peter was guiding out of Marblehead, on the western basin of Lake Erie, the Ohio State record smallmouth was caught on a 1/6-ounce gold-plated Crippled Herring. Not surprisingly, Peter's new Sonic Baitfish, manufactured by Mack's Lures, is a hybrid of these two longstanding fish catchers. 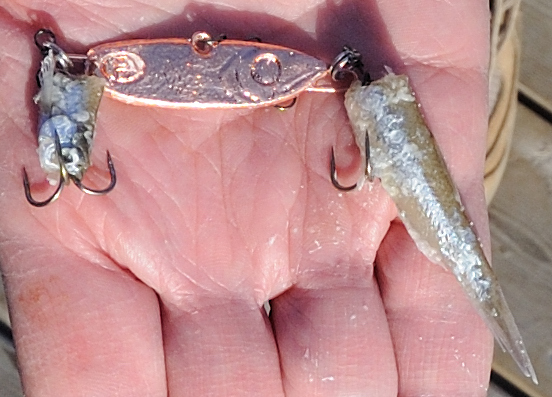 But, I was fishing the new lures with a little modification. I'd doctored them by removing the front and back double hooks and adding an O-ring to the holes. Next, I attached one of Bernard Yong-Set's Stringease Fastach clips to the ring and then a #6 Gamakatsu round treble hook. Before I added the hooks, I also threaded a salted emerald shiner head through the shank of one of the trebles and the tail section of the minnow through the other hook. It is a deadly trick. Indeed, as anyone who has followed our antics on the In-Fisherman Ice Guide television series knows, for the past 3 or 4 years I've been using Fastach clips on nearly all of my spoons and Jigging Raps. Not only does the clip add separation between the bait and hook, the minnow head and/or tail provides a target point. Too, because you slide the eye and shank of your hook through the centre of the head before attaching it to the clip, it is impossible for a fish to hit it and not get hooked - or to pull it off. I demonstrated this a couple of times on various television segments we shot and so many folks e-mailed, wrote and phoned into In-Fisherman afterwards, inquiring about the clips and the technique, that it was the single most talked about/requested item. It was crazy - but the tactic works. By creating a separation and a pivot point, you can double, even triple the number of fish you catch. Especially walleye, sauger, yellow perch, black crappies and bluegills. Indeed, the analogy I like to use to explain the concept is thinking about topwater poppers like the Skitter Pop, X-Rap Pop or Pop 'R. When you think about it, the noisy popper is the delivery agent for the feathered tail. When a bass hears and sees the lure on the surface, it is attracted by the noise, profile and vibration, but what triggers it to bite is the little featured tail. It is the same thing in the winter when you add a Fastach clip and a minnow head or tail to a Jigging Rap, Williams Spoon or in the case last night, a Sonic Baitfish. The size, shape, colour, vibration and noise of the lure attracts the fish, while the minnow head or tail seals the deal. There are other delivery agents, too. Earlier in the week I got into a huge school of 12- and 13-inch jumbo yellow perch that looked like Sumo wrestlers on steroids. I was using the new Marmooska Tungsten Dancers that feature tiny chains between the lure and the hook. Don't ask me why it is, but anytime you're fishing for yellow perch through the ice, there is something magical about having a short separation between the lure and the hook. Once again, the lure acts as the delivery agent, calling in the fish, while the baited hook trips their trigger. Something else to consider: having the separation between hook and lure seems to be more important with smaller and sluggish species - like bluegills, crappies, perch and even smaller walleye and sauger. 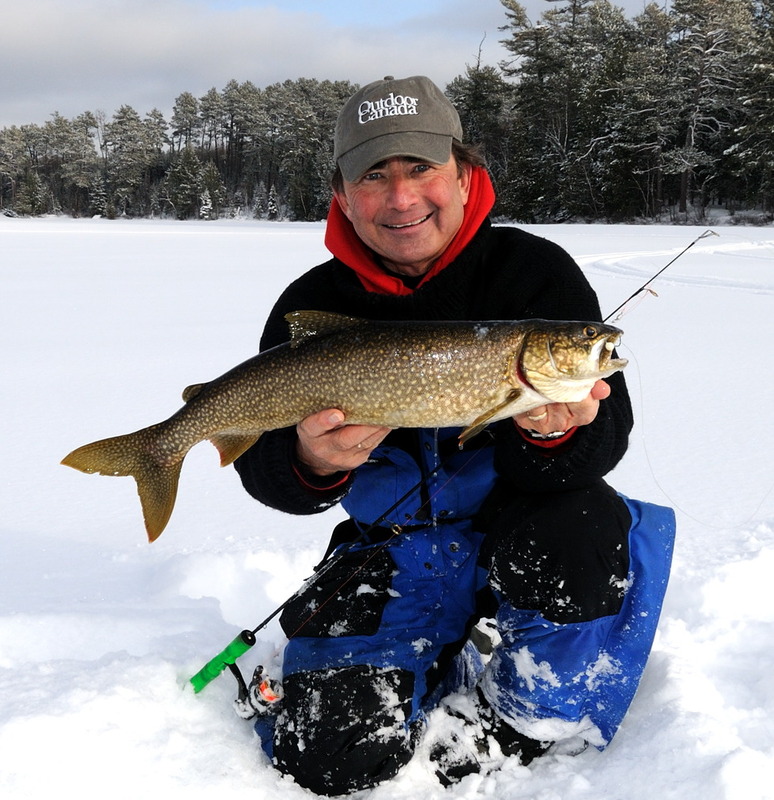 When you move up in the ice fishing world, on the other hand, and target big toothy critters like King Kong northern pike and giant lake trout, the separation between hook and delivery agent is totally unimportant. Indeed, the biggest Jigging Raps are one of the top three best lures you could ever use to catch giant northern pike through a hole in the ice (more about that later in another blog). But guess this: when we jig the Raps for pike, we always clip off the bottom treble hook. It is totally superfluous as the pike always engulf the lure and get hooked on the front and/or back single hook. Ditto with lake trout. Separation between the delivery agent - your lure - and the hook is unimportant. Primarily because you're usually jigging the lure moderately aggressively and the trout run it down, even when you try to take it away from the fish. But, when you're targeting bluegills, yellow perch, black crappies, walleyes, sauger and even whitefish sometimes - always, always, always consider separating your hook from the delivery agent!